Introduction: One of the most frustrating, difficult, time-consuming, and sometimes unreliable parts of laparoscopic surgery is closing the trocar sites, especially in obese patients. If these sites are closed improperly or not closed, the patients are at increased risk of port hernias (0.23% – 3.1%) and/or bowel incarceration possibly placing the patients’ life at risk. In rare cases, obese patients may develop a Richter’s hernia where a diagnosis of obstruction is either missed or delayed due to the lack of classical symptoms. The lack of visualization, increased time and the degree of frustration either leads the surgeon to decide not to close the port site or to attempt a suboptimal closure. Currently there are no devices which offer a quick and effective method for closing trocar sites. A novel solution has been developed to automatically, safely, reliably and quickly close these port sites using a secure suture closure. Animal studies have shown that 12 mm port sites can reliably be closed within 30 seconds. This novel device is currently being evaluated in patients undergoing laparoscopic gastric bypass surgery. 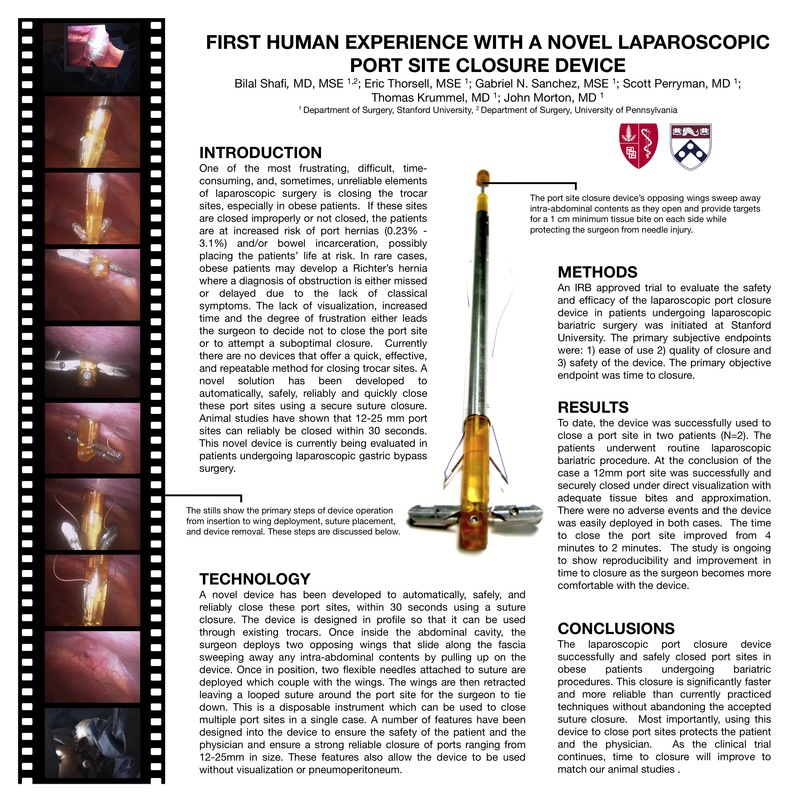 Methods: An IRB approved trial to evaluate the safety and efficacy of the laparoscopic port closure device in patients undergoing laparoscopic bariatric surgery was initiated at Stanford University. The primary subjective endpoints were: 1) ease of use 2) quality of closure and 3) safety of the device. The primary objective endpoint was time to closure. Results: To date the device was successfully used to close a port site in the first patient. The initial patient underwent a routine bariatric procedure. At the conclusion of the case a 12mm port site was successfully and securely closed under direct visualization with adequate tissue bites and approximation. There were no adverse events and the device was easily deployed. The time to close the port site was 4 minutes. The study is ongoing to show reproducibility and improvement in time to closure as the surgeon becomes more comfortable with the device. Conclusions: The laparoscopic port closure device successfully and safely closed port sites in obese patients undergoing bariatric procedures. As the clinical trial continues, time to closure will improve to match our animal studies.